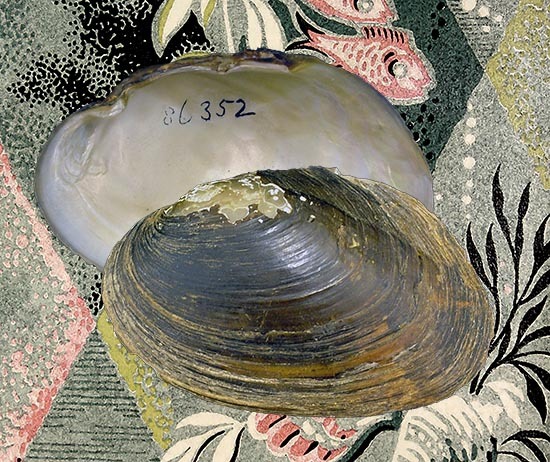 The July 2018 Mussel of the Month is Pseudodon inoscularis. Pseudodon is a widespread genus of 16 species extending from Japan to Indochina, Myanmar, and the Sunda Islands. USNM 86352. River Salwen, Tavoy, Brit. Burmah (type). We have been putting off dealing with Pseudodon as MotM for more than a decade because even though it is a well-known and species-rich genus, the taxonomy has been a mess. When we did our global checklist (Graf & Cummings, 2007), it was evident from the number of subgenera employed by Haas (1969) that there was a lot of phylogenetic diversity that needed to be accounted for. At the same time, Brandt (1974), in his comprehensive treatment of Thai mussels, had proposed a novel classification. Since then there has been a good deal of phylogenetic work* (e.g., Pfeiffer & Graf, 2015, Bolotov et al., 2017) and Pseudodon sensu lato has so far been divided among three genera: Pseudodon s.s. (16 spp. ), Bineurus (5) and Monodontina (4). This table shows the classifications used in the few publications needed to get a handle on the relevant taxonomy: Zieritz et al. (2018), Bolotov et al. (2017), Graf & Cummings (2007), Brandt (1974), Haas (1969), and Simpson (1914). These works provide a reasonable overview of more than a century of malacology. Click here to get this table as a larger PDF. The splitting of Pseudodon s.l. into three genera follows Bolotov et al. (2017), but that phylogenetic analysis did not consider several of the former subgenera: Chrysopseudodon, Cosmopseudodon, Diplopseudodon, Nasus, and Obovalis. For the time being, we have left those as part of Pseudodon s.s., but we won’t be surprised when more splitting is necessary. The other thing that is evident from our alignment of Pseudodon s.l. classifications is that, with the exception of Brandt’s (1974) cross-genus over-lumping, the species-level circumscriptions have been relatively stable since Simpson (1914). Pfeiffer, J.M. & D.L. Graf. 2015. Evolution of bilaterally asymmetrical larvae in freshwater mussels (Bivalvia: Unionoida: Unionidae). Zoological Journal of the Linnean Society 175(2): 307-318.